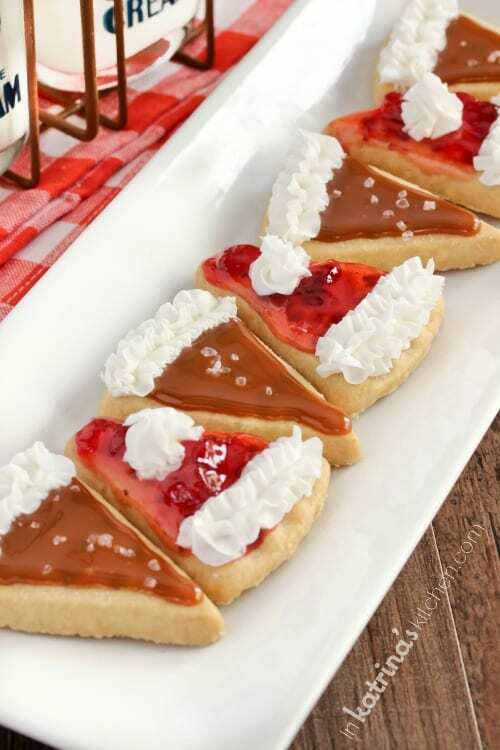 Salted Caramel Pie Slice Cookies and Strawberry Pie Slice Cookies are making an appearance on my Thanksgiving dessert table this year. 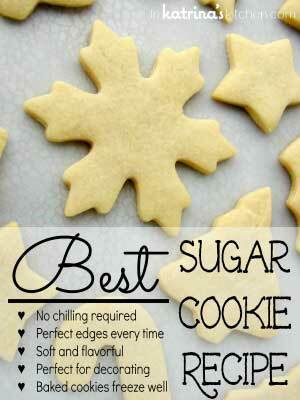 These adorable cookies only take minutes to make! I know that turkey thinks it is the star of Thanksgiving dinner, but the dessert table has always ruled that special Thursday in my home. I mean who does turkey even think it is anyway? Since when does protein get the upper hand over frosting? When Christi of Love From the Oven sent me a copy of her new cookbook Smart Cookie I had such a hard time choosing which cookie to begin making. 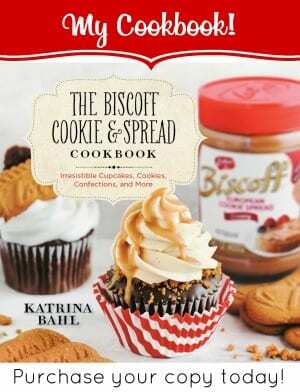 Christi’s book is all about leaving the baking to the experts so that you can focus on the fun part- decorating! 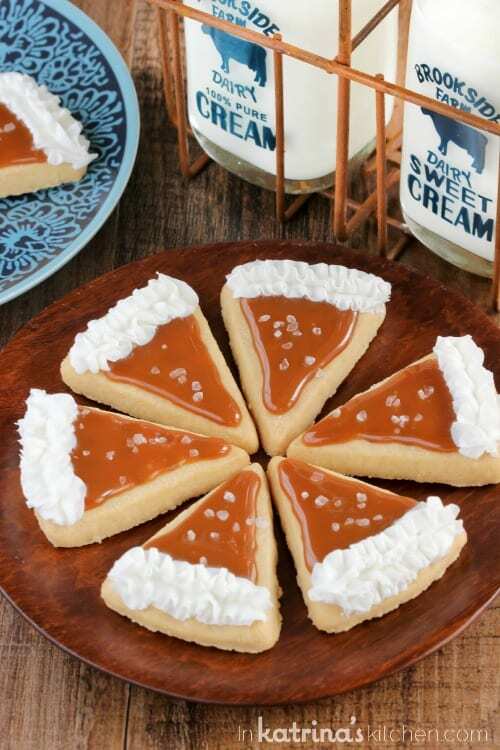 If you’re like me you want to make adorable, fun treats for your dessert table (or classroom, or party!) but you just don’t have that many hours in the day. That’s why I love this cookbook! 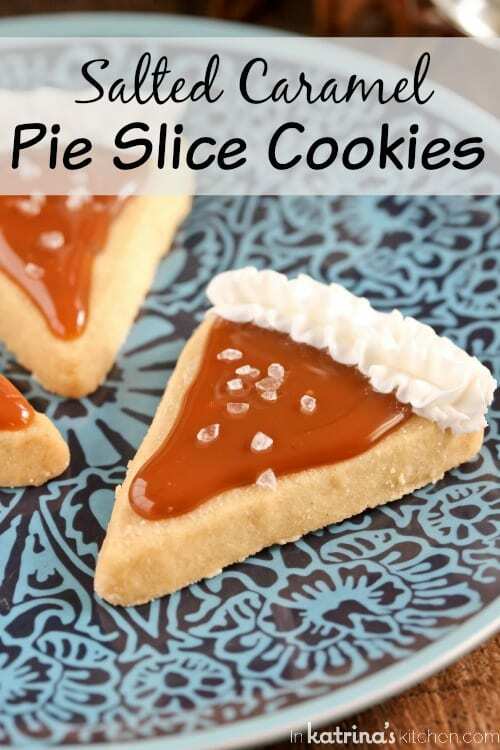 In 10 minutes I had a dessert tray full of Salted Caramel Pie Slice Cookies as well as some adorable Strawberry Pie Slice Cookies. Honestly I had a hard time just sticking to 2 flavors! Let’s just skip the turkey this Thanksgiving and go straight to dessert. 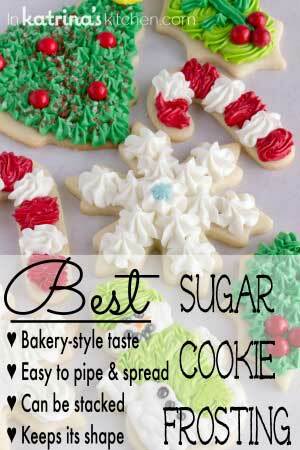 Spread each cookie with ice cream topping and frosting. 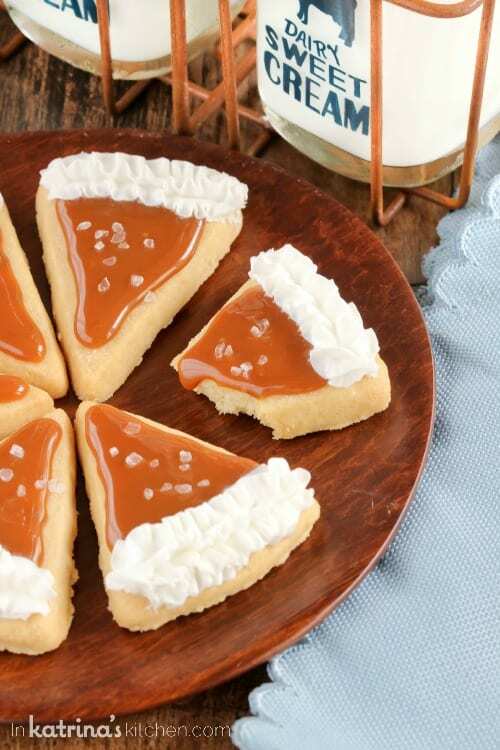 Lightly sprinkle caramel cookies with salt. Seriously go grab this book! I can’t recommend it enough. It makes a great gift and I’ll be giving a bunch away to friends and family this Christmas. 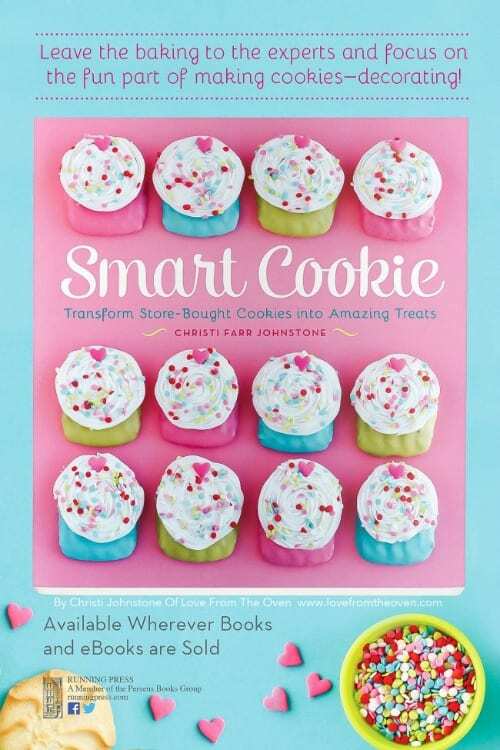 Disclosure: I received a free copy of Smart Cookie. This post was not compensated. I consider the author a personal friend. As always opinions are 100% my own. Oh my gosh, these are so stinking cute! They would certainly show up the turkey at the table! These are just about as cute as it gets! Love them. These are so cute! I love fun cookies! These cookies are so pretty! 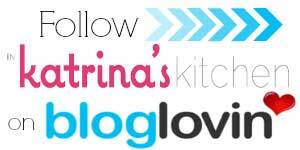 Love Christi’s book! Sharing! These are so cute and creative. I can’t stop smiling when I look at them! These ARE so cute. I love that you can customize them seasonally — blueberry pie cookies anyone? 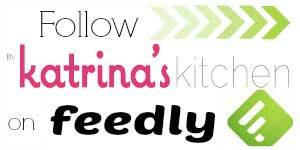 Not only do these sound delicious – they look SO STINKING CUTE!! These are so cute! I love how easy they are – great concept to the book! These are too adorable omg!! I need to check out that cook book too. Pinned! Are the shortbread cookies store bought or home baked? I used store bought ones (Walkers). 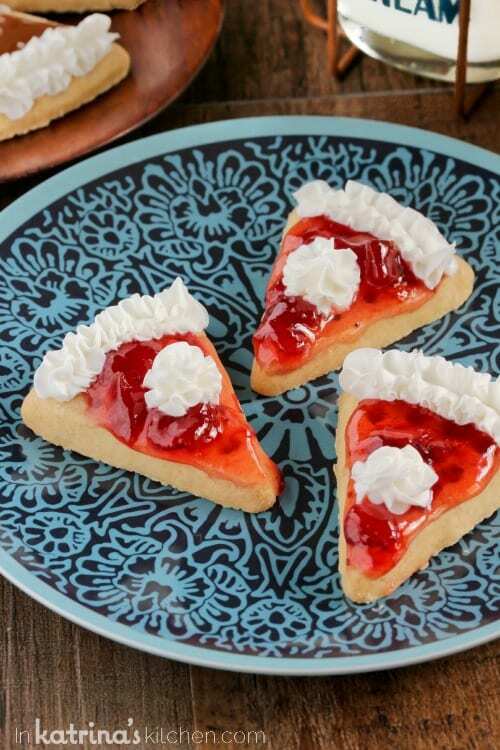 Your cookies are so darn cute! And they look delicious. Pinned for later (of course.) Thanks!